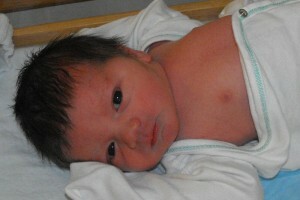 He was born in Oswego Hospital on Sept. 1, 2010. He is the son of Amy and Tyler Belawske, of Oswego. He is so beautiful!! Congrats! He’s so beautiful!! Congratulations, you guys! Love to you and your wonderful family! You two make beautiful babies. He was so wide-eyed for the picture! I can’t wait to hold him. I am so happy for you two and for Eli, he is going to ROCK as a big brother!